PowerJacks are designed to pull or push strips of hardwood flooring into place and hold them tightly for hands-free nailing. 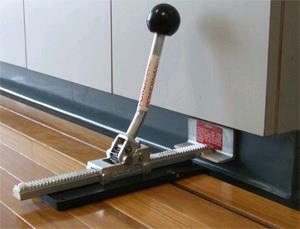 Works with almost any thickness flooring. Use it next to the wall at stud locations. Can be used away from the wall by screwing it directly to the floor. Works under toe kicks as well. * Please call us for any questions on our powerjack hardwood flooring jack rentals in Langley, also serving Clinton, Freeland, Greenbank, and Coupeville.